Rap fans got some bad news last month when the street date for Rick Ross's God Forgives, I Don't LP got pushed from its anticipated December 13 release to sometime in 2012, but it turns out the Bawse will hit us up with some new tunes relatively soon: he's just announced he's dropping a new mixtape. "It's Official Drop'n New Mixtape!!! 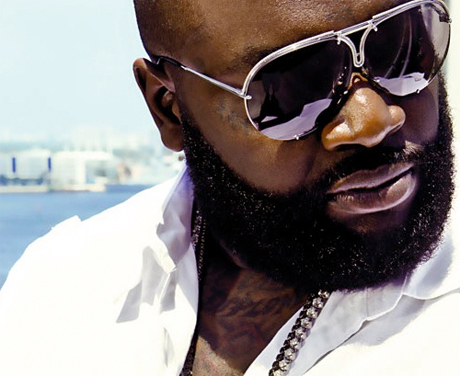 #RozayNewTape," Ricky Rozay wrote on his Twitter last night (December 15), adding this morning "something special coming." That's not much news to go on, but his label, Maybach Music Group, posted a tweet of its own, explaining that the title and the release date for the project will be unveiled next week. The mixtape will feature work from DJ Scream, who also tweeted, "This @rickyrozay tape gon be a problem!! Be Nervous!! #MMG"
So far it's unclear just what will pop up on the mix, but here's hoping the tape sets off a stream of new Rick Ross material, followed shortly by that Drake joint venture YOLO and God Forgives, I Don't.